'Stithen ac' (meaning: place at the strong oak) was a seventh century saxon village in Hertfordshire. Over time its name was recorded as Stithenæce (c.1060) and then Stigenace (1086) before eventually becoming Stevenage. It remained a small village for many centuries and even when it became a market town in the late 13th century, its population remained very small (around 1000). By 1801, the population had grown to 1,400 and almost 100 years later it was granted an urban district council and the population reached 4,000. In 1946, the New Town act was passed and Stevenage was selected to be the first of these New Towns. Six new neighbourhoods were created during the 1950s and 1960s, and the Queen opened the new town centre in 1959. The population of the town now stands at around 81,000. As part of the development of the New Town, an area of farmland in 'Fairlands Valley' was to remain an open space and the landowners were served a compulsory purchase order in 1951. At first, the area remained as farmland and it continued to be used for this purpose until 1968. 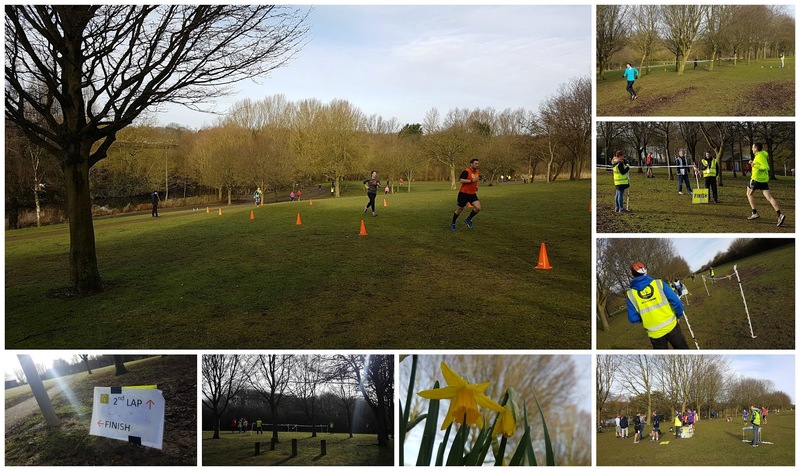 A master plan to turn the area into the town's principal area of recreation had been written in 1966 and was finally actioned in 1971 when the land was handed over to Stevenage Urban District Council, who subsequently started work on transforming the farmland into a park. The plans were for a park with areas of green space and lakes. However, Fairlands Valley was dry so a dam was built in order to retain the water required for the lakes. 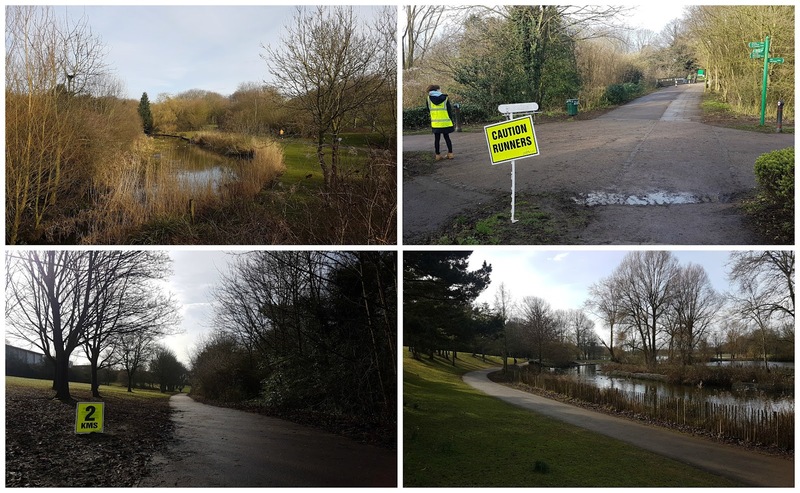 Fairlands Valley Park was opened in 1972 and is made up of 120 acres of parkland and the four lakes cover 20 acres. Fast forward to present-day and the boating lake is central to the offerings of the outdoor activity centre which also has rope and rock climbing facilities. There are also 2 children's playgrounds, an aqua park, a trim trail, woodland, and a cafe. 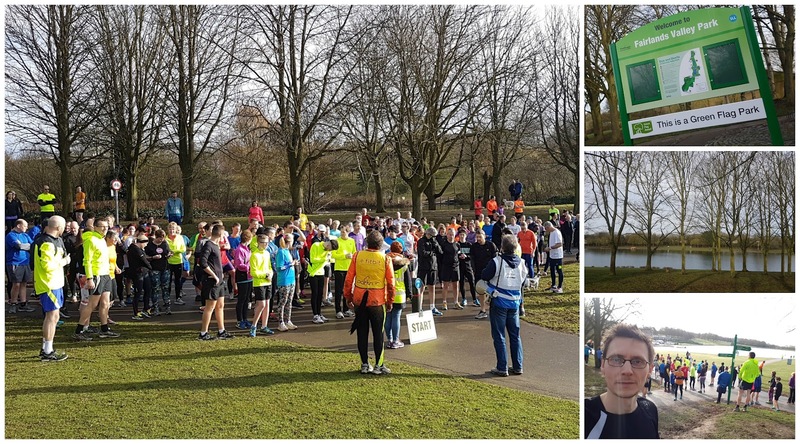 On 28 May 2016, the park became home to Stevenage parkrun. I was eager to visit straight away, but specifically waited until event 39 to run here because I am 'Steven' and my 'age' is 39, so in my head it made perfect sense to pick this particular event. 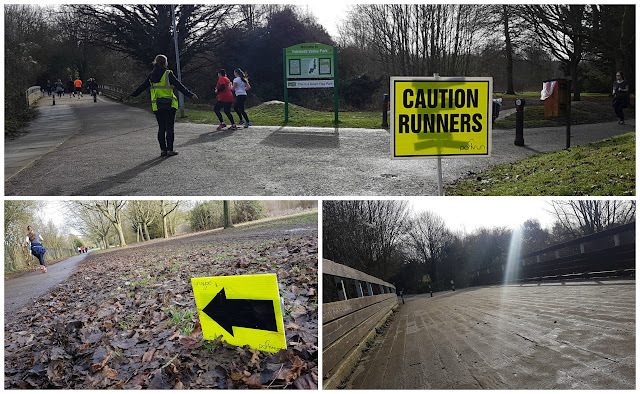 As usual before visiting a new parkrun venue, I always read the venue's course page in order to be prepared for the day - one thing stood out, and that was that the toilets in the park do not usually open until about 9.30am (update: they now open at 8.30am!). I checked online and saw that there is a large complex of shops just down the road from the park. I had intended to pop into McDonalds to use their facilities, but in the end I went to Asda and used theirs instead - as I was feeling super-efficient, I also did a bit of shopping. Upon arrival at the park, I parked in the main car park just off Six Hills Way - this road is named after six humps on Six Hills Common which are 'almost certainly' Roman burial mounds, or Tumulus dating back to 100AD. These form the largest surviving Roman Barrow group in the UK. They are classed as a Scheduled Ancient Monument and are protected by law. Anyway, the car park is one of three and all are free of charge. I knew roughly where the start of the parkrun was, so I headed off in the general direction - if you are visiting here for the first time, I'd give your self a nice buffer of time to find the start, which is approximately in the centre of the park. The run itself takes place over just under two laps of the park. Underfoot is mostly tarmac, but there are a couple of sections where the course goes off-road. It's not a flat course, but by no means is it hilly - it just gently undulates all the way round. For shoe choice, I went with my road shoes and while they were great on the tarmac, I did suffer a little on the off-road path which had been made quite slippery by a rainy few days leading up to the event. Overall they were the right choice of footwear. For the record, buggy runners will be fine around here. So, for the detailed course description. It starts on a cross-roads on the west side of the park in between the Boating Lake and the Millennium Lake. The runners (204 when I visited) head south along the west side of the boating lake and then follow the curved path around its southern tip. A right hander send the runners through an outcrop of trees and onto the cycleway that runs along the side of the Six Hills Way. 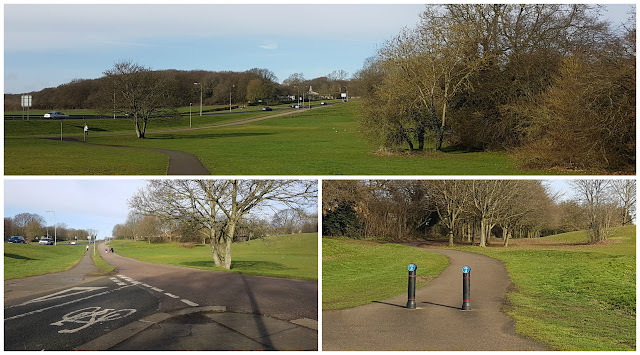 When Stevenage's roads were designed, cycling infrastructure was built into its design and there are 40kms of segregated cycleways that run throughout the town - there's a really interesting article about them on the Roads Were Not Built For Cars website. I had intended to take my bike with me and have a ride, but I decided against it at the last minute. Anyway, after running on the cycleway for about 50 metres, the runners turn back into the park and soon turn offroad for a section through an avenue of trees - this is where I had trouble in my road shoes as it was so slippery. I managed to find some traction by staying to the edges of the path. It doesn't last for too long and the course soon rejoins the tarmac path and heads off into the northern half of the park. 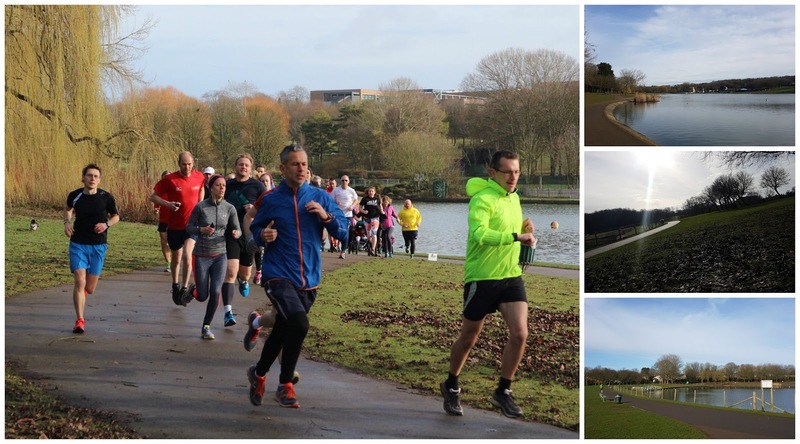 The route follows the natural tarmac path until reaching the northernmost point of the course where the runners cross a wide bridge and head back along the eastern side of the chain of lakes. After passing the finish area, the runners swing right, cross another bridge and are back at the start area. From here, they follow the same route as they ran on the first lap until they return to the eastern side of the lakes. The finish is located up on the grass area to the left, so the runners peel off of the main path and head uphill on grass and then have a final dash for the finish line. Barcode scanning takes place up here and the runners can then head off home or wander over to the park's cafe for some refreshments with the rest of the team. The results for event 39 had been processed and I had received my results text and email by the time I arrived home. As always, I recorded the GPS data of the course and you can view it on Strava, here: Stevenage parkrun 39. 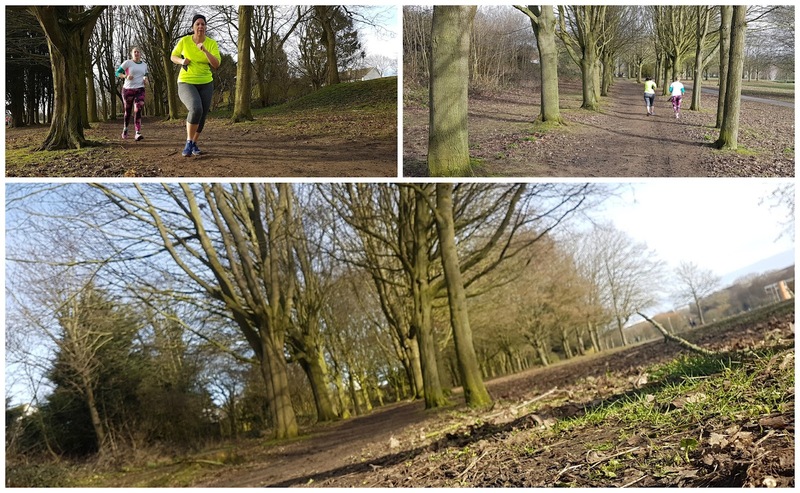 This course has a bit of everything and I really enjoyed it - it's undulating and has twists, but not enough to have a big impact on your time. It has the off-road section, but not enough to require trail shoes. Plus the scenery is constantly changing, so there's always something to keep things interesting. This is definitely one for the 'return to' list, but next time I will definitely take my bike and check out the cycleways after the run.